Potrefena Husa Platnerska is a high quality, Czech pub style restaurant located just 2 minutes walk from the Old Town Square and from Charles Bridge. 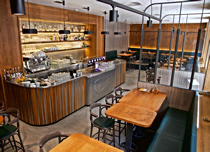 Newly refurbished, Potrefena Husa Platnerska is designed in an industrial, yet warm style to reflect its heritage as a "Staropramen restaurant", and also to evoke the historical romance of beer brewing in the Czech Republic. On offer is good honest Czech and International food, and some of the freshest Staropramen beer in Prague. The standard of cuisine is high, the portions are large, and the dishes are well presented. Both food and drink is also very reasonably priced. The hearty Czech fare ranges from goulash, roast duck and beef steak to schnitzel and spicy pork ribs. While international dishes include such delights as XXL burgers, fresh fish, various pasta dishes, and salads. The food is served with traditional sides such as bacon dumplings and cabbage, or choose from the more modern mashed potatoes, French fries and roast potatoes. Potrefena Husa Platnerska is one of only a handful of restaurants in the city to sell tank Staropramen beer, which is delivered from the brewery in huge temperature controlled airtight tanks, which ensures the freshest beer around. The taste is simply superb. In total there are a total of 7 draft beers on tap, both light and dark, as well as wines, Champagne, cocktails and soft drinks. Potrefena Husa Platnerska usually has a buzzing atmosphere because it is popular with local Czechs, so reservations are highly recommended. It may be pub style, but this is a restaurant, and the locals book in advance for this type of place in Prague. For traditional Czech fare with high modern standards in the centre of Prague, Potrefena Husa Platnerska Restaurant excels. TIP: Book your table through Prague Experience and receive a free welcome drink: Slivovice or Becherovka. Potrefena Husa Platnerska is a fine restaurant for groups of all sizes, and for any occasion, from business lunches and family gatherings to stag and hen parties. Food and drinks are inexpensive, and the atmosphere is good. Advance reservations are essential.